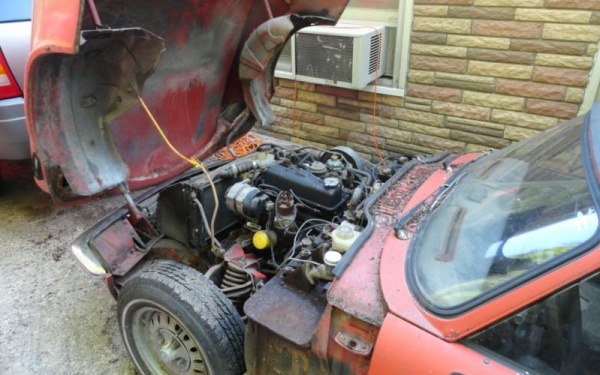 The rat rod guys may think they are tough, but they have nothing on the owner of this 1977 Triumph Spitfire. He is a brave man. The floor is gone and it may burst into flames at any moment, but somehow he managed to drive it every weekend last summer and fall. He calls it cheap thrills, we call it scary. Still the idea of a sub $1k beater is tempting. Find it here on eBay out of Southfield, Michigan for $800 or best offer. Thanks goes to Jim S. for the tip. The engine could still use some fettling, but the the brake master and clutch cylinders have already been rebuilt. With a flip up front clip you get excellent access to the engine so working on it is a breeze. You can sit on one of the front tires while you wrench away. Sure beats bending over an engine bay. Parts are cheap too. In fact, the Spitfire could be one of the cheapest vehicles to restore. I had a Spitfire for a summer and it was a blast. Unfortunately, at 6’2 it was a little tight for me. This one is not only tight, but a little unpleasant. The seats are trashed and the wiring needs gone through. The Interstate Battery sign is a nice touch though. There is still some summer left, so throw some new tires on there and enjoy your own cheap thrills! Had a Spitfire GT6 was a fun car. Triumphs were that and then some when new. Wait,… did I see something move on that last photo of the interior ? There must be things growing that you don’t want growing in there…. Other than that, all in all a fantastic classic car deal ! 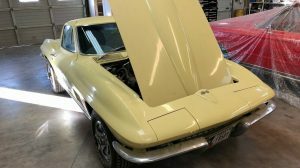 Bought a brand new one same color as this one in 1973. It was my first new car… I went to the dealer to buy an MG, and came home with a Spitfire. It was fun to drive, buy my carpool rider back then was about 350 Pounds… I had to get rid of it. I would get rid of the carpool rider rather than my wheels! I like the houndstooth seats! It is a nice break from the cheap looking vinyl, but obviously it didn’t hold up too well either. I had a 69 Spit, was lot’s of fun, easy to work on obviously & I drove the living piss out of it. 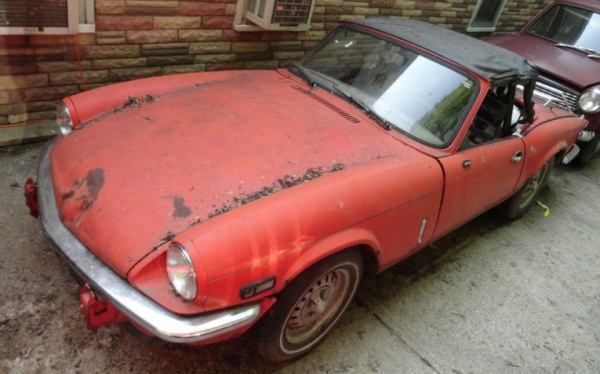 I’ve had my ’75 Spitfire since 1991 and love it… but I will never get my money out of it… and the countless hundreds of hours of labor. But the feeling of accomplishment I get from driving it will always remain. This one needs everything, and it’s such an easy car to restore. If you really want to re-do a Triumph, get a TR6 – for the time and sweat equity you invest, you’ll have a more easily sell-able car when you’re ready to move on. For me, I will always have my Spitfire! It’s just a part of me. 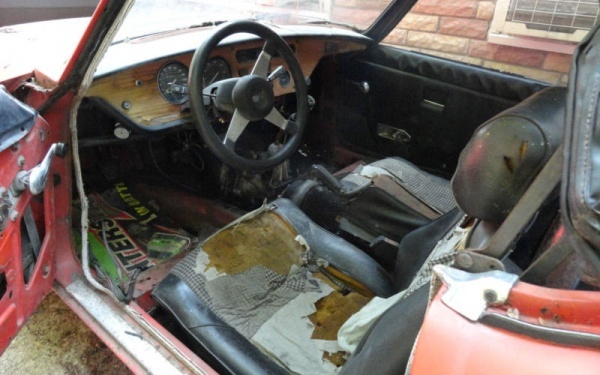 I drove an early 70’s Triumph GT6+ for a summer ….it ran like the angels were pushing and handled like a dream. I have a 1976 1500 that I have fully restored. I believe that is just as expensive to restore a TR6 as a Spit with greater return on the investment. This car is done- its a parts car. For not too much more money, one can find a decent driver that has floors ! These are fun cars for weekend fun, autocross, shows, etc but for daily driving will not be as much fun. Easy to work on but that practice is too often especially for a car that hasn’t been maintained as this one appears. Yes, some wise comments above. I love Spitfires, have owned and restored them, and they are surely one of the best value fun-for-your-money classic cars out there. They are fun to drive, simple to work on and I think they look great for a cheap mass-produced car. However, their low prices are both a blessing and a curse. If you were looking for a well-sorted good driver quality car then you would be delighted at how little you might have to pay for one. 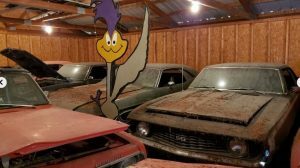 That makes them one of the cheapest routes into classic sports car ownership – which is obviously a good thing. On the flip side, because a really good condition Spitfire is priced so low it makes it uneconomical to restore them once they get as too rough. 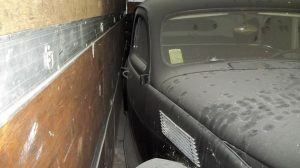 Looking at his featured car, and assuming that the body work is as rotten on the inside as it looks from the outside, this would cost a lot of time and money to put right. 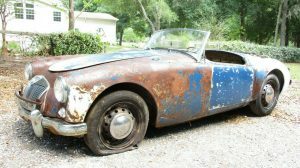 As RandysSpit said above, it would cost virtually as much money to restore a really rough Spitfire like this as it would to restore a TR6 or TR4 in equivalent rough state but the TR4 or TR6 would be worth several times as much money when competed. So cars like this one in this state are not worth saving unless someone is doing it for purely sentimental reasons – like it has been in the family for decades, or it was their first date car or whatever? On purely economic grounds it will be parted out or scrapped. It is a shame really as the pool of surviving cars will of course be reduced every time one is scrapped. I’d absolutely recommend the attractions of the Spitfire – just look around for a good one ! If you are going to go to all this trouble, search for one of these out West or down South. Michigan salt is murder on cars. It sold for $600. Looks like someone is in for some cheap thrills!